Sabino Canyon is one of the most popular places to hike in Tucson, and as I was getting acquainted with the area last year I took to hiking alone. One morning I was hiking in Sabino and on my way back to the parking lot something came toward my trail fast. Being a newcomer to the southwest, I had no idea what it was, but I thought it gorgeous indeed. This huge lizard had the most incredible black and bright orange pattern in its skin - it looked like tiny beads glued on. It was remarkable. And his tiny black tongue, darting in and out was so charming. I kneeled down and starting taking photos immediately. He let me so get surprisingly close, I was delighted to take pretty good shots from only about two feet away. He finally crawled off and I went about my business, feeling thrilled about my brush with this stunningly exotic looking creature. I had no idea what it was. When I got home I went online to discover that my reptilian friend was a Gila Monster. 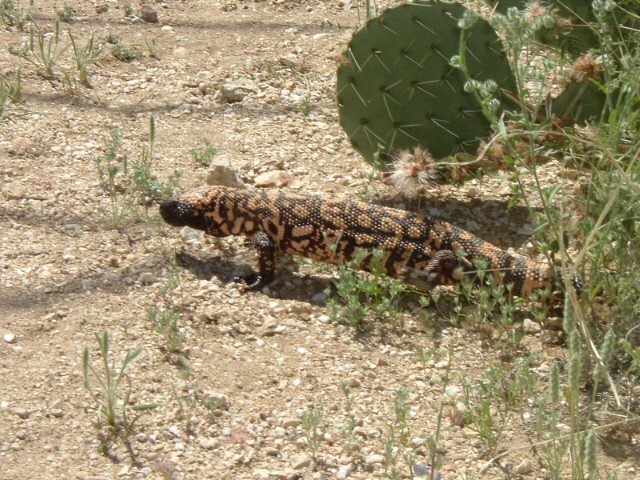 What is a Gila Monster? Well, there are only two poisonous lizards in the United States, and he's one of them. 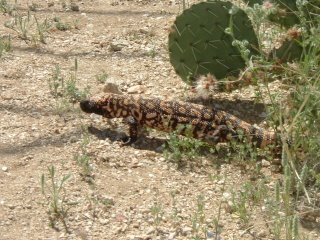 To quote Desert USA, "Gila Monster's teeth have two grooves that conduct the venom, a nerve toxin, from glands in the lower jaw. The toxin is not injected like that of the snake, but flows into the wound as the lizard chews on its victim." Oh lovely. Despite these revelations, I must say Mr. Monster (or should I just call him Gila?) was very polite and almost a ham for the camera.